Jennifer Brown is a workplace diversity and inclusion expert, and author of Inclusion: Diversity, the New Workplace and the Will to Change. Informed by more than a decade of consulting to Fortune 500 companies, she will foster a thought-provoking discussion about inclusion, intersectionality, and the call to action for allyship that encompasses a broad spectrum of diversity -- including gender, sexuality, race, and ethnicity. This is the keynote event of Ally Week, which focuses on educating and engaging our community in order to become better leaders, collaborators, and supporters of diverse identities and perspectives. 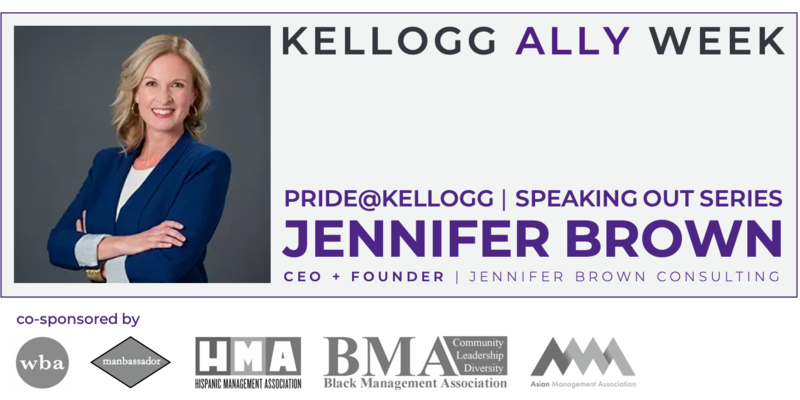 It is also part of the Pride@Kellogg Speaking Out series, in which Kellogg hosts a prominent LGBTQ business leader on campus in an effort to raise visibility, promote intersectionality, and engage Kellogg’s incredible ally community. This event is generously co-sponsored by the Women's Business Association, Manbassadors, the Hispanic Management Association, the Black Management Association, and the Asian Management Association.